and several people asked for a blog post. In my opinion, this is way too mundane for a blog like Noahpinion, so let me write the post. Here, $Z$ is the amount of payroll taxes the government charges per unit of labor, meaning that $W+Z$ is the pre-tax wage rate, and $W$ is the after-tax take-home pay the worker gets. Also, $L$ is the level of employment in the market with the payroll tax, while $W^*$ and $L^*$ are what the wage and employment would be if there was no payroll tax at all. Noah's point is that if you are employed in this labor market, you can't truthfully claim you "make" $W+Z$ and that the government is taking $Z$ out of "your" money. Why? Because if the government didn't take any of "your" money at all, the wage rate would be $W^*$, which is a lot less than $W+Z$. The intuition for that is that workers and employers share the costs of payroll taxes. Employers know that facing a smaller take-home pay, fewer people will want to work so they compensate somewhat by raising the wage rate to attract more workers. 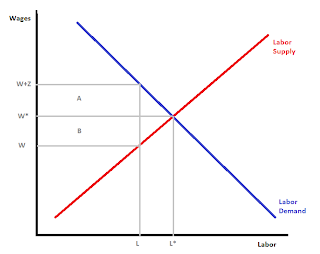 Total government revenue is given by the area $A+B$, of which $A$ is paid for by employers in the form of lower profit margins, while $B$ is paid for by employees in the form of lower take-home pay. 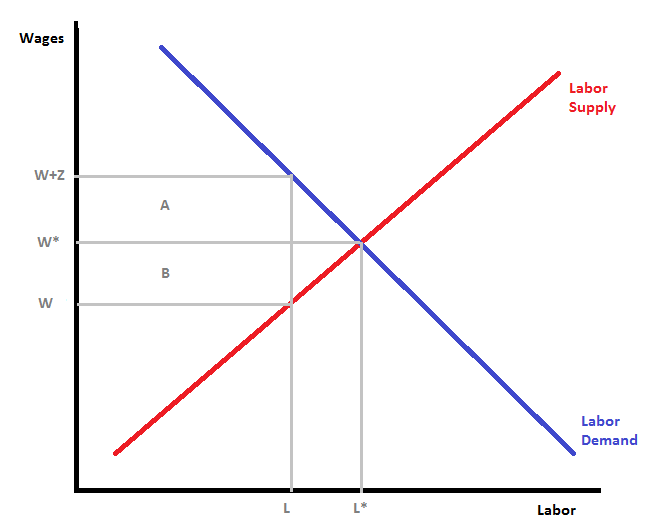 This depends on the relative wage elasticities of labor supply (workers) and labor demand (firms). For those who don't know, a wage elasticity is a measure of how much labor changes in response to a change in wages. Notice that if employers are more wage-elastic than employees (graphically this would mean that the red line is steeper than the blue line), then employees would pay most of the payroll tax. On the other hand, if employees are more elastic than employers, then employers will pay most of the tax. The thing to notice here, though, is that there is no distinction at all between the "employer contribution" and the "employee contribution" to the payroll tax--all we need to know is that the government will collect a total of $Z$ total taxes per unit of labor. If we say that the employee has to pay $Z$, then employers will pay a wage of $W+Z$, whereas if we say that the employer pays all of $Z$, then employers will just pay a wage of $W$ instead. Either way, employers pay $W+Z$, and workers only get to keep $W$. The implication is a well-known and fundamental result in economics: the legal incidence of a proportional tax has absolutely no economic significance. But I must urge caution! This logic only applies to a proportional tax, and income taxes are definitely not proportional--in addition to the flat-rate Payroll taxes, we charge an additional progressive income tax that counts the employee's contribution to Social Security as income, but not the employer's contribution. Thus in reality making employers pay for a greater share of payroll taxes would push workers into lower income tax brackets, which does have real economic effects!